Sounds strange, but this is true. Frogs are married in some part of india, according to a mythological ritual. There is a purpose behind this. In extreme summer, when there is no sign of rain, a yagna is performed to please Lord Indra. In Hindu Mythology, Indra is the person responsible for rains. This yagya is nothing, but wedding of frogs are per the hindu rituals. 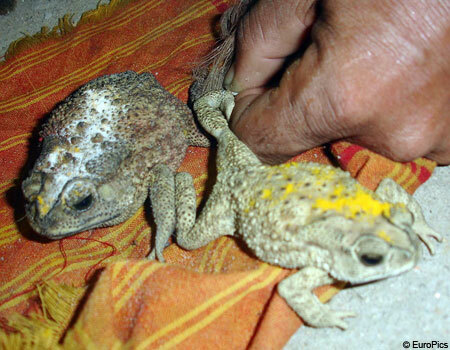 Vermilion is applied on the forehead of female frog to mark her as the life partner of the male frog. This is an age-old tradition that if frogs are wedded, then Indra Dev will be pleased and monsoon will come. People attend the wedding in large numbers. This wedding is performed with artifical frogs as well as with real frogs. The rationale behind this tradition is that during rainy season, frogs came out and croak to please Lord Indra. The wedding is performed for the same reason and this is thought that frogs will be pleased and welcome rain gods. Read this article for a frog wedding in Varanasi. This is not limited to India. The same ritual, wedding of frogs has also taken place in Bangladesh. The objective is the same, to bring rain on earth.The “bride” and “groom” came from two neighbouring villages 110 kilometres (68 miles) north of the capital Dhaka, according to the Bengali paper Jugantor. Villagers organised the wedding ceremony because the region was suffering a water shortage as it waited for monsoon rains to arrive, according to school teacher Noor Mohammad Kalon, who was a guest on behalf of the “groom.” More than 250 men, women and children came to the wedding. We all danced and sang,” the teacher, 42, told AFP by telephone, adding that the guests were served a traditional wedding feast of rice, lentils, fish, beef and sweets. “The bride and groom were in special wedding dress. We blessed them in the ceremony and released them in a nearby pond afterwards. Read the full bangladesh wedding story of frogs. The most recent wedding of frogs has taken place inTakhatpur, India. This is also celebrated in remote part of Assam. Can you answer these questions on Mahabharata?